Piedmont Truss & Lumber, Inc. would love to do business with your company. As the most trusted name in Northern Nevada, you can count on us to take care of your lumber needs for your entire project. 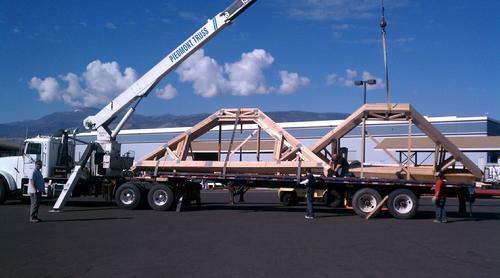 From the lumber package to the floor and roof trusses, your success will be our accomplishment. Service - Knowing and understanding our customer's needs, and striving to exceed their expectations before, during, and after the sale. Quality - Quality products achieved through superior design, engineering, workmanship, materials, and a commitment to a team approach emphasizing individual responsibility and contribution. The highest quality is assured at every step, from the first customer contact to the final product delivery. Experience - A solid knowledge of truss design, engineering and assembly, grown from over 45 years of experience in the structural component business. "We have worked with Piedmont on quite a variety of projects and they have always provided excellent customer service, professionalism and a drive for perfection on each and every project. Their timely follow-through on each promise and deadline is the reason we send all of our truss design needs to Piedmont. Thanks again for the great service."